The War Symphonies: No. 4 in C minora (1935/6) [64'12]; No. 5 in D minor, Op. 47b (1937) [48'09]; No. 6 in B minor, Op. 54c (1939) [27'53]; No. 7 in C, Op. 60, 'Leningrad'd (1941) [78'50]; No. 8 in C minor, Op. 65e (1943) [63'16]; No. 9 in E flat, Op. 70c (1945) [25'45]. Kirov Orchestra, Mariinsky Theatre, St Petersburg, dRotterdam Philharmonic Orchestra/Valery Gergiev. 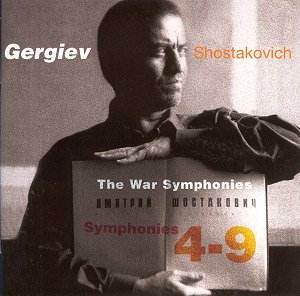 Gergiev's Shostakovich justly has a vast following. This five-disc set of the War Symphonies brings together six performances that represent an emotionally exhausting journey. We begin with the notorious Fourth Symphony, a huge work that marries the compositional exuberance of the Second and Third symphonies with the vast canvas of the Seventh and Eighth. It is an unsettling mix � nothing is seemingly as it should be, even in formal terms, with two huge movements framing a much shorter one. The history of the Fourth is probably more famous than the piece itself. Rehearsed by the Leningrad Philharmonic under Fritz Stiedry, the work never made it to its intended premiere, having to wait until the great Kondrashin unveiled it in Moscow in December 1961. Gergiev is given a spacious recording which accommodates the fiery, cacophonous climaxes with ease. Dissonances become almost scary as is the obvious intent. The orchestra is superbly drilled, not only in the tricky faster sections but in the sheer control required for those moments when Shostakovich 'freezes time', or when, as at the beginning of the third movement, he retreats to an elusive, disjunct world. It is in this latter portion that Mahlerian elements perhaps come most obviously to the fore - except for a Mahler 2 allusion around 13'10 - but if one thing remains in the listener's mind it is a sense of the bizarre married to a sense that this is a genius at work. The glacial end is spot-on. True, no recording can hope to equal the sheer force of this work live, as Gergiev's recent LSO account at the Barbican reminded those of us present (review), but this is as near as one can get. The Fifth of course brings us to far more familiar territory. The gritty playing is fabulously captured by the recording. This is fantastically involving but also full of careful detail, and that control is present still; the way Gergiev can persuade his violins to thin down a line to the merest of threads is spell-binding. There is a tremendous momentum built up from the low horn unison entry accompanied by relentless piano. It is inevitable that there will be a current of unrest still present at the famous horn/flute duet; interestingly you can hear the horn player's nerves. The string discipline that marks the opening of the Scherzo is most impressive, as is the sweet solo violin. Yet interpretatively it is the hugely interruptive timpani that make their point felt the most. The prayer-like strings of the slowly swelling, concentrated Largo make this the emotional centre-point of the entire work. Whatever compromise there may be in the rest of the work, there is precious little here. No surprise then that Gergiev effects maximum contrast in his finale. He even times the very end well. Interestingly, he emphasises any aspect of the foregoing that might conceivably have been a hint of the subversive - solo trumpet piercing through swirling strings around 2'25, for example - so that the end seems even more puzzling than usual. The Sixth, like the Fifth, found public favour around the time of its premiere. Strange, then, that it has dipped in concert-goers' attentions, especially when one encounters a performance as committed as this. The feeling of monumentalism was implicit at best in Ashkenazy's reading with the Philharmonia on the South Bank last November (review). With Gergiev it is almost heart-breaking, reaching its apotheosis with the long cor anglais melody. Gergiev avoids any suggestion of rushing whatsoever, and all of his wind soloists respond with their best in their various solos. The elusive, disjunct second movement provides the perfect foil for the completely madcap finale. Gergiev opts for the nearly slapstick rather than the simply outrageous. The Seventh is another work with history, with its first three movement composed in a besieged Leningrad. A combined Rotterdam/Kirov orchestra is fully able to realise the huge climaxes, with the fairly close recording contributing to the frightening effect of the long crescendo. Gergiev's way with the 'keening' figure is particularly memorable. One really feels as if the Soviet chill immediately afterwards is a requisite part of the experience. A distinct feeling of unreality to the parts of the second movement that try for cheerfulness just serves to underline the full-blown parody later. Resplendent brass in the third movement, long lines and a sense of breadth lead to a finale of great string depth, huge excitement next to desolation and a superb, blazing close. It is almost de rigueur to hear commentators refer to the Seventh as one of the weaker of the cycle; Gergiev clearly does not believe them. The Eighth is hardly a slighter piece. Gergiev's includes a rawness that is most impressive, one that encompasses exploratory woodwind - around 4'20 in - as well as positively crushing climaxes. The long, desolate cor anglais solo that emerges out of the first movement's huge climax is a particular high-point. This, I would suggest, is the finest performance of the set - or maybe, if pushed, equal first with the Fourth. Like a Mahler symphony, this Eighth seems to include the World, and it is perhaps this all-encompassing emotionalism that makes this performance so very exhausting to listen to, yet so very rewarding. Unlike so many, Gergiev has the full measure of this piece. After the canvasses of the Seventh and Eighth, the Ninth is a strange way to end this set, but perhaps this would appeal to Shostakovich himself. There is no doubting that Gergiev revels in the outrageous antics, the sudden juxtapositions of the first movement, the catch-me-if-you-can chase of the third or the jovial bassoon of the finale. Huge care has gone into the balancing of parts to the whole, and the orchestra seems to revel in Shostakovich's own mastery. Booklet notes by Andrew Huth are informative and superbly written. This set is a must for all students of Shostakovich.